With former President Bill Clinton being mentioned in today’s blog, I thought it would be a good time to tell you about the Alliance for a Healthier Generation which was founded by the William J. Clinton Foundation and the American Heart Association. The Alliance for a Healthier Generation works to address one of the nation’s leading public health threats—childhood obesity. The goal of the Alliance is to reduce the prevalence of childhood obesity by 2015, and to empower kids nationwide to make healthy lifestyle choices. Through the William J. Clinton Foundation, President Clinton promotes the values of fairness and opportunity for all. His vision is the Foundation’s mission: to strengthen the capacity of people in the United States and throughout the world to meet the challenges of global interdependence. Together with the generosity of citizens and volunteers, President Clinton and the Foundation are vigorously working to advance those principles that move us beyond differences to a common future of shared responsibility, shared benefits, and shared values. A pretty cool thing that I want to mention is that the Alliance and the American Academy of Pediatrics have joined together with The Very Hungry Caterpillar by Eric Carle, to help families learn about healthy eating. The Very Hungry Caterpillar eats many foods on his journey to becoming a butterfly. With this book we can help children on his or her journey to grow up healthy and strong. 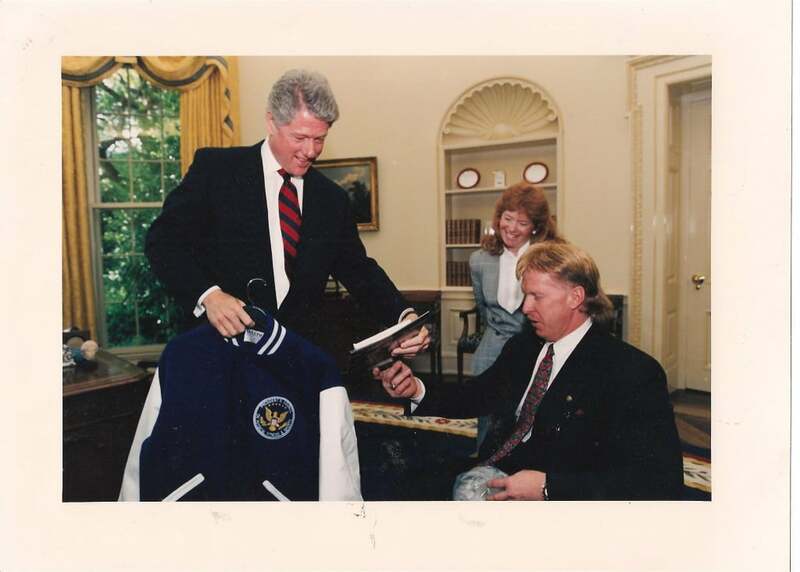 I had to opportunity to serve under President Clinton on the President’s Council on Physical Fitness and Sports when he was in office. He is a great man and one that I have the utmost respect for. I was the only person reappointed to serve another term under his administration. He would always make the time to come greet me and my guests and would give me the “thumbs up” sign whenever he saw me at the White House or in the Rose Garden. I was the first person with a disability to serve on the President’s Council on Physical Fitness & Sports under President George H. W. Bush. To learn more information about the Alliance for a Healthier Generation, please visit www.healthiergeneration.org and for more information about the Clinton Foundation, please visit www.clintonfoundation.org. 6:00 a.m. CST – We packed up the trailer and got ready to leave for Texarkana. 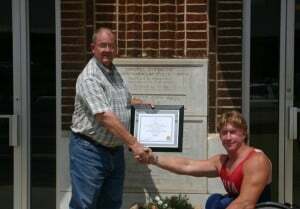 7:15 a.m. CST – I pushed five miles from Caddo Valley to the city hall of Arkadelphia to meet with Mayor C.T. Hollingshead, City Manager Barbara Copelan, Rick Brumley, the director of Arkadelphia Parks and Recreation, and Ann Kelly, the City Director of Arkadelphia. Ann Kelly represents perfectly how beneficial a healthy lifestyle is. She is 73 years old, still works out and is still in great shape. She is going to be a pen pal of the ‘Big Push’ to keep us updated on how her fitness program is going. We talked about the benefits of proper nutrition and exercise. Ms. Kelly thought the idea of the healthy lifestyle journal to keep track of your progress was a fantastic thing to get people involved to take responsibility for and action for a healthy lifestyle. 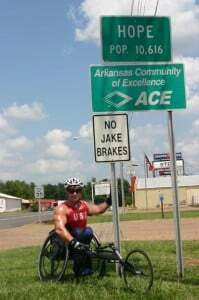 Kevin tells listeners the 'BIG PUSH' across America over 2,500 miles for proper Fitness & Nutrition in Arkadelphia, Arkansas. 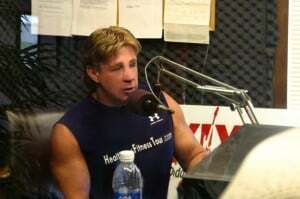 How this was just the beginning that the - Fitness 4 All 50 State Tour - would follow and be much more aggresive with a bigger tour team and the best Fitness & Nutritional experts as partners of this huge 50 State Tour that would start the school year fall of 2012 & last approximately 3 years. We will give around 4,000 presentations to schools in all 50 states & about the same # of Health & Fitness presentations around 4,000 to city mayors, councils & community leaders & state Governors, departmental & state leaders. It is a herculean task but one that must be done to bring the best tools and information to all areas in each state especially our nation's youth, parents, teachers, administrators & school boards. 8:30 a.m. CST – We headed to the Arkadelphia radio station KYXK 106 FM for a taped interview with Lanny Brothers. I told him all about the ‘Big Push Across America’, how I was doing the Tour to inspire and motivate all people to get fit through proper fitness and nutrition, and that we were providing tools and resources to help youth, parents, teachers, community leaders and city and state officials. I told him that people could learn more by going to our website, www.kevinsaunders.com. Lanny recorded our session and wanted to play it several times to his listeners. He was also interested in having us on again sometime soon. He wants us to come back on the “Fitness 4 All 50 State Tour” as his guests. We met another DJ named Sherry at the radio station office who told us that she would like to do a phone interview with us from the road. We took her information and I agreed to do an interview with her. Being able to reach others via radio is just as important. She wanted to tell the community about the “Big Push” and tell them my story as well. 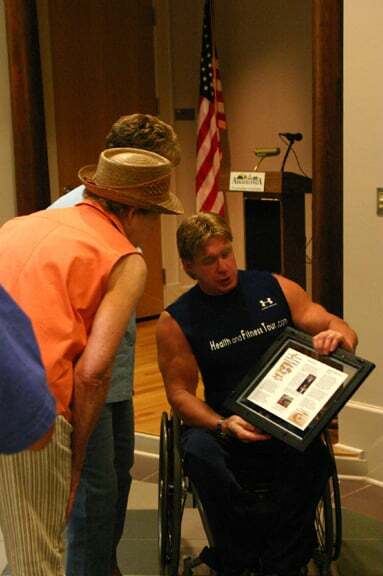 I’ve had the honor of being a motivational speaker for many years and love to inspire and motivate others to keeping giving life their very best and Never Give Up in their goals and dreams. 10:00 a.m. – We went by the new Arkadelphia Parks and Recreation facilities. Director, Rick Brumley gave us a tour of the new building, which has been open for only about nine months. The facility was impressive with a huge pool, indoor track and basketball court, walking trails, and a baseball field. I told Rick that I’d love to work with him on improving the health and fitness of the citizens of his community and also work with him by providing tools and resources to create lasting health and fitness initiatives for all citizens. 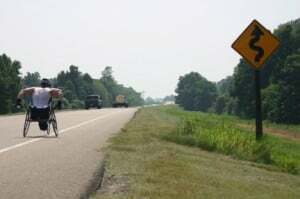 10:30 a.m. CST – I pushed 20 miles to Gordon, AR. The push took about 2 hours. 12:30 p.m. CST – I took a short water and Gatorade break and then pushed another 11 miles on to Prescott, AR where we met with Mayor Howard Taylor. I presented the Mayor with a plaque and a copy of my book. I told him about the purpose of the Tour and left him with brochures for the city council. 2:45 PM – Breaking for lunch, I ate an apple and a granola bar and drank Gatorade and water. *Note* – The terrain from Arkadelphia through Gordon, Prescott, and Hope was very hilly. It took a lot of endurance to be able to push up and down the hills. 3:00 p.m. CST – I pushed on to Hope, AR.I took a picture by the city limit sign. Kevin sits by the Hope AR city limit sign Welcome to Hope, Arkansas Kevin! It was a challenging push over through the steep hills, downhills and curves, now I'm here and ready to give another presentation! It took about an hour and a half to push 17 miles. When we arrived, we went directly to the Hope City Hall where we met with Hope City Manager, Catherine Cook. We presented her a plaque and my book for Mayor Dennis Ramsey in front of a sign that noted Hope as the birthplace of President Bill Clinton. 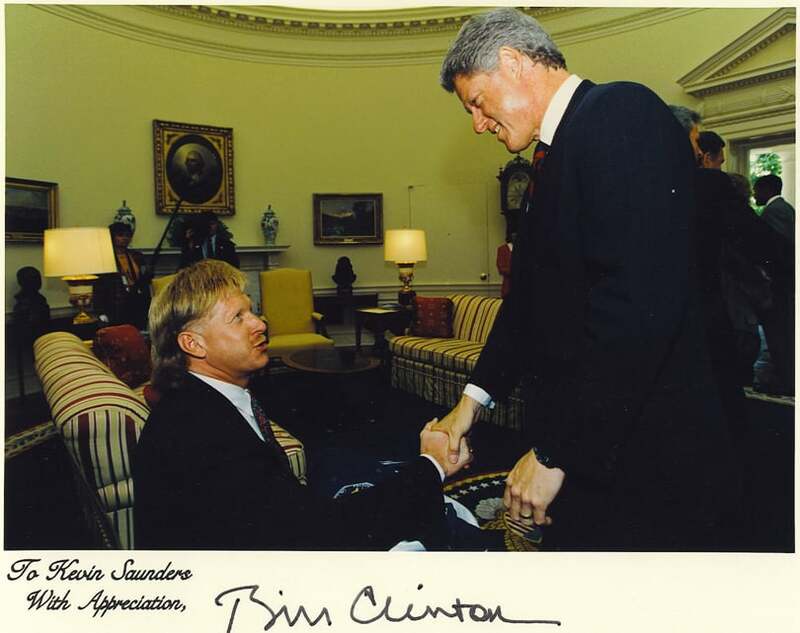 This was a great moment for me since I had the opportunity to work on the Presidents Council for Physical Fitness and Sports during President Clinton’s time in office. We also left Catherine with brochures from the Tour to leave with the city officials. 4:30 p.m. CST – We immediately got into the Jeep and drove to meet with KTBS Channel 3, the NBC affiliate in Texarkana. At the station, we dropped off some a Beta tape of b-roll for them to use during out interview on Monday. 6:00 p.m. CST – We drove on and checked into one of our sponsors’, Baymont Inns and Suites, hotels in Texarkana. We usually bought our food and just cooked it in our hotel room on a electric skillet so we could eat the right amounts of foods that we had good recipes for which gives you the satisfying taste for your palette. You need to have the right macro-nutrients which is a fancy way of saying protein, carbohydrates and fats. Because of my special needs for energy requirements, I was staying on a 60 percent carbohydrates and 40 percent protein diet and can’t forget fats which was around 10 percent. Because I was averaging 50 miles per day, I had to keep my energy levels high. I was doing media interviews, presentations to schools, meeting with state and local leaders and of the communities we stopped at. I was really keeping busy. I also strive to do my best presentations every single time. I compare speaking to doing a marathon. I compare it to running or pushing in a racing wheelchair a 15K which is 9.3 miles AS FAST As You can GO – ALL OUT! In a 15K race a good time for the overall winning runner men is around 45 minutes plus and for the overall women race winners the winning time is around 55 to an 1 hour. As a professional speaker a when you give a great performance and it sounds like you are telling the story for time. The educational fitness and proper nutritional presentations to motivate the audience as a speaker and inspire the students, parent’s teachers and school administration takes between 45 minutes to 1 hour. The – Health & Fitness Summits – that are given to the Mayor, city and community leaders and Governor, state officials and state leaders is given like it was the first time you ever presented it, but because you have spent so much time working hard on your presentations for the schools, parents, teachers and Administrators or the – Health & Fitness Summits –the local Mayor, city and community leaders or Governor, state officials and state leaders takes about 45 minutes to an hour as well and remember, as a professional speaker everyone of your presentation needs to be customized to that city or state and be given so that the audience is paying close attention because you make it interesting and compelling for them and as it was made just for them for their benefit and it was! The audience can spot a speaker how does not speak from the heart. Spending all the time I had as a professional speaker, World Champion Paralympics wheelchair athlete and eating healthy food slow helps you feel full. Sometimes it is really hard to find healthy food that hasn’t had bad oils used on it. Or they have the vegetables soaked with butter. Why is the chicken breast to get at the restaurant plump and juicy? Not because it is a young bird that has been caponized so it will grow much bigger than a normal chicken and you can sell them when they are young. Now, the food industry wants to grow and sell fast so there is no time to take special care of the foods you may be tempted to eat In the restaurant or fast food store or convenience store. Sometimes those chicken breast are even injected with fat so they plump up and taste SO juicy and good. It is still possible to make those same foods taste good without putting on all the bad stuff. We will share with you some of the secrets from one of our partners for the – BIG PUSH –to find out how we do a better job to get people of all ages especially our nation’s youth to make healthier choices and be educated so they can determine freshness and quality of a product. I’m really fortunate I grew up on a farm learned how to grow a garden just over a quarter of a miles long filled with corn, potatoes, green beans, tomatoes, bell peppers, strawberries, cabbage, lettuce, eggs, meets and more. I was in FFA where I went to judging contest to judge vegetables, fruits, meats, eggs, potatoes, rice and more. I was finished up high in the contest with many schools being represented from the Midwest. This has helped me I go with my wife Dora to the grocery store to shop as I explain how to choose the best product just as the adult judges did – the professional judges would explain and show you this is why we placed this piece of fruits, eggs, vegetables, meats etc. here with this grading – after our contest was over. 10:30 p.m. CST – We updated the –BIG PUSH- blog for today and downloaded pictures and put captions on the ones we were going to put load up on the website along with today’s blog. We went to bed.